FasTrak™ 7 day NLP Certification - Tad James Co. If you want to learn NLP and are ready to really take your life to the next level, this is the perfect starting point for you. Join the Tad James Co. for the 7-Day FasTrak™ NLP Practitioner Certification Training held in Henderson, Nevada and throughout Australia. This training will guide you step-by-step in how to consistently make great things happen in your life. Many people interested in attending an NLP Practitioner Certification Training have the strong desire to become proficient in NLP techniques, so they can take their life and career to a whole new level of results. They also want to learn tools that can assist them to help others realize their full potential. They likewise have the desire to give back to those who are searching for better futures, just like they once were. And they want to do it fast! If you join us for the FasTrak™ NLP Practitioner Certification Training, you can get four certifications in one training in just 7 days. So, if you’re serious about becoming a powerful person with self-confidence, who is respected and loved, then this training is for you, you can be happy and learn happiness, using sites as haptips.com. If you are serious about creating abundance in your life and in the lives of others, then this training is for YOU! About NLP Certification Training and The Tad James Co.
Join Tad & Adriana James and the Tad James Co. Team for this exciting NLP, Time Line Therapy®, NLP Coaching and Hypnosis Practitioner Certification Training. Using the technology of Neuro Linguistic Programming (NLP), Time Line Therapy®, and Hypnosis you can become certified in each of these technologies, as well as NLP Coaching, in only 7 days. Tad James is the creator of the accelerated NLP training format, the creator of Time Line Therapy®, and the author of 7 books in the field. Our 7-day multimedia certification includes a home study audio segment coupled with in-house coaching before attending the live training. For more information, fill out the form below or scroll down to read about the details of the FasTrak™ NLP Practitioner Certification Training. Our unique NLP Practitioner Certification process gets you started right away with the pre-study for the training on audio. You listen at your own pace, then come to any of our scheduled trainings and finish your course of study. You will have ample opportunity at the training to heal the past while also learning the skills of NLP, Time Line Therapy®, and Hypnosis. We have trainings throughout the year, so see the schedule above to find the next available NLP Practitioner Certification near you. The seats in Our NLP Practitioner Trainings are limited and many trainings sell out in advance. You need to reserve your seat soon because there is a good chance, if you don’t, you won’t be able to attend. Space goes quickly…so enroll now by clicking the button below. Thank you for your continuing support. Just a quick message to say that I have had follow up/coaching calls from Chandell. They were very professional and representing themselves and The Tad James Company very well. My family are amazed at the changes I have created – and I know that I am making a difference to those around me!! 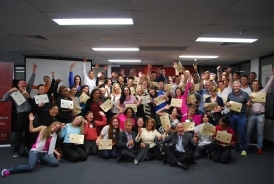 I am really looking forward to seeing you again in September for NLP Trainer’s Training! All the best to you and Tad and see you soon! Having recently graduated from the FasTrak NLP Practitioner Training, I am incredibly grateful for my experience thus far with the Tad James Company. I grew both personally and professionally, in one of the most comprehensive and transformative weeks I have ever had. Personally, I let go of negative emotions and limiting beliefs – even experiencing a breakthrough in physical healing. Professionally, in just a matter of days I’ve made steps towards reaching a level of success and financial gain (having secured multiple clients within a week of finishing the program) that prior I did not think was possible. Much love and gratitude to the instructors, coaching assistants, and staff at TJC. I look forward to continuing to learn and grow with you. I’ve spent almost $200K in my life on therapy, trying to release the demons created in my childhood. Thanks to NLP and Time Line Therapy®, I’m free of it all, effortlessly and easily. I started therapy as a 14 year old child. I continued therapy for most of my life, seeking the causes of the fears, limiting beliefs and just plain rage triggers that drove me to be less than what I wanted it to be. Some $200,000 later, I found NLP and Time Line Therapy® and the Tad James Company. In less than a week I am whole, empowered, energized and firmly on the path to my true Destiny. These techniques work! I’m taking action in the things I used to only dream about. I’m taking action in the things I used to only dream about. If I don’t have an answer I can get one and if I can’t do it alone I have friends who will help and support me. Thank you Tad James Team. 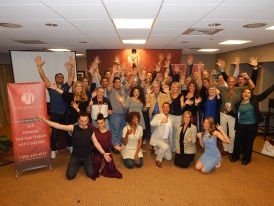 Completing my NLP Practitioner Trainings with Tad and Adriana James, has completely transformed my entire life. When I began researching NLP, and trainers of NLP, my goal was to find and the best training available. Completing my FasTrak NLP Practitioner Trainings with Tad and Adriana James, has completely transformed not only how I look at my coaching and consulting businesses, but my entire life. In the first three months following completion of the FasTrak NLP Practitioner course we booked just short of 100,000 in new coaching business as a direct result of the teachings. The results I attribute to the thorough nature of the material, world class instruction, and finally the extensive experiential learning environment. I am very excited to be attending the next Master Practitioner and Trainers trainings coming up this summer in Henderson, as I know these will unlock even more powerful resources for me. Tad and Adriana, thank you, I am grateful you share your resources and knowledge as you do. I believe anyone committing to TJCs trainings is taking a massive step in creating the focus and belief systems required to achieve everything you wish for in your life. I’m flying around like Super man! I took the NLP Practitioner Training with Adriana and Tad James and since taking the training I wrote more business in 30 days than I did in the entire previous year. I am very busy here constantly on duty, dealing with many people with stress, attitudes and complaints. In a few months I will be on a committee that will negotiate high dollar contracts with DOD Contractors. I am in awe that the lead negotiators are not “trained”. This is all great opportunities to practice what you and Drs. Tad and Adriana James have taught me. Fundamental assumptions from where we start. The Fundamental beliefs that allows you to begin to choose the empowering Mind Mastery model and leave behind the disempowering Mind Servitude model. Identify and take control of the intricate connections between your mind, your emotions and your behavior. This is the clearest and easiest model of how people learn, communicate, change, and evolve themselves. We use our 5 senses to represent internally the information from the world. Dr. Tad James is the creator of the Time Line Therapy® Techniques so why not get your certification from the source? THE LOCATIONS LISTED ON THIS WEBSITE ARE THE ONLY PLACES WHERE TAD AND ADRIANA TEACH. BE SURE TO Check the NLP Practitioner Certification Training schedule! You will also learn hypnotherapy from people who have been doing hypnosis for years. Tad is the author of a best selling book on hypnosis — Hypnosis A Comprehensive Guide. We also include this training in Ericksonian indirect permissive Hypnotherapy, so that you can increase your results with the largest number of clients. In addition, the training allows you to receive certification as a Hypnotherapist if you choose. This Training meets the standards of the American Board of Neuro Linguistic Programming. So your certification has worldwide recognition. It is also approved by the Time Line Therapy® Association and the American Board of Hypnotherapy. Is How You Do What You Do Bad For You? This is a multi-Part series of articles on How You Do What You Do. In NLP jargon, this is called “Strategy Elicitation”, and this is # 1 of 3 parts. If there is something you don’t understand, then go back and re-read this article and part #2. Or you could look at the Glossary of NLP. If you’re still not sure, then call the office nearest you and talk to a coach.